While the Samsung Galaxy S5 screen is the component that brings luster to the phone, it is also the most delicate part; a small amount of impact can break or damage it. In this post, I cited several display problems an owner may encounter while using the phone. These problems are based on emails I received since I started posting support articles for the Galaxy S5. If you are currently having problems with your phone, especially with the display, please try to browse this page as I may have already addressed it. If you can't find your problem here, feel free to email me or join the Google+ community I recently created where I often hang out to answer questions. Blank screen and unresponsive to key press. If your phone shows blank screen and won't respond even if you pressed the Power/Lock Key, the battery may have just been drained. So, plug the power adapter and connect the phone to charge. For drained battery, it may take sometime to show the usual charging icon, so leave the phone be for 5 minutes. Blank screen after a drop. 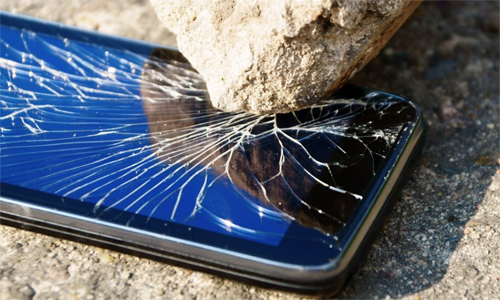 Drop tests online would suggest the new Galaxy S5 can withstand waistline drops without getting damaged with or without external casings. However, any drops higher than the waistline can cause devastating result. If your phone's screen goes blank after a drop, try to check first if the battery is still in place; you can remove and re-insert it to make sure. After doing so and the screen remains blank, you should have it checked because the display may have been damaged or some components may have fallen off due to impact. Blank screen while using an app or gaming. The Galaxy S5 is a powerful phone but it's not perfect. There would always come a time when its RAM run out or its CPU cannot accommodate everything especially if you have a lot of apps running in the background. Heavy games like Real Racing 3, Asphalt 8, etc. require hefty amount of RAM, GPU and CPU usage. So, if your phone's screen becomes blank while playing one of those heavy games or while using some apps, there is a big chance the app or game crashed. When hitting the Home button fails to make the phone respond, remove the battery to turn the phone off. Insert the battery and turn the phone on. That should do it. Blank screen after an update. There are several variations to this problem. The most common is when backlights turn on but there's no display. The other one is the display becomes blank after showing the logo. And there were users who said they've already seen the Home screen but the screen suddenly turned dark and became blank and phone unresponsive. The best way to fix this issue is to boot to recovery mode and wipe the cache partition. Most of the time, this problem is caused by corrupt caches due to recent update. Clearing them wouldn't do any harm to your phone or data. Blank screen and the phone won't charge. It is important that you rule out the possibility that it's just a drained battery issue and the charger is busted. If you're sure that it's not the charger, nor the USB cable, nor the battery, then it's a hardware issue. You need to have the phone checked by a technician the soonest time possible. Screen is blank but I can still hear notifications. It means the entire display assembly isn't working. There is a possibility that the flex cable became loose inside and the contact between the display and the motherboard was lost. Bring the phone to a technician and have it checked. Unresponsive screen after a drop. If you dropped your Galaxy S5 face down and the screen still shows the usual picture but won't respond to your touch, the digitizer or its circuit may have been broken. Unluckily, you need to buy the entire display assembly not just the digitizer. So, for this, you will have to spend, more or less, $275 to $300 because the brand new OEM display assembly is worth $229.95 last time I checked, then there's the service charge. Unresponsive and hot screen while gaming. Give your phone a break! Or, at least, let it cool down a bit. If the phone overheated, its overall performance is affected and the unresponsiveness may not be a screen problem but due to the fact that the CPU together with the GPU cannot function well. It is also not recommended that you game while charging the phone; that will emit too much heat. Unresponsive screen while using an app. Try to reboot the phone as it may be a temporary glitch. Once booted up, use the same app to see if the screen still becomes unresponsive, if so, try to use other apps. If the result is the same, it's more of a hardware problem. Otherwise, the app may be on the verge of crashing. Clearing the cache and data often helps. Unresponsive screen while texting. You may already have a lot of text messages. Try to delete some and see if the problem still persists. If so, it's time you cleared both the cache and data of the messaging app you're using. But note that you may lose all your messages by doing so. The screen has a crack outside. It's the digitizer that's cracked and more often, one portion may still be responsive to the touch while the other isn't. The best thing to do is to have the display assembly replaced. The screen is totally broken but the phone still powers on. It's just the display assembly that's broken and that's good news. If you have the display assembly replaced, the phone may still work like it did before. The screen has crack inside and it's bleeding. The phone may have suffered water damage before the screen suffered an impact that may have caused the crack. Apparently, there's nothing you can do but to send the phone in for repair.